New Delhi, March 1st, 2019: The Singapore Tourism Board (STB), in partnership with St+art India Foundation and Impressario Group, marked the second phase of its brand campaign ‘Passion Made Possible’ with a three-day experiential festival – Singapore Weekender. The festival showcased the talents of a dozen Singaporean artists through a mix of art installations, wall murals, interactive workshops and live performances in New Delhi. South Delhi neighbourhood Lodhi Colony saw a burst of colours as the artists transformed the walls into life-size murals and integrating Augmented Reality (AR) in art forms to create new dimensions. The Singaporean artists, Yip Yew Chong, Eugene Soh, Yok & Sheryo and Sam Lo incorporated their perspectives of the world in their artwork as they gave the Indian audience a glimpse into the Lion City’s arts and culture. Visitors to the ‘Singapore Weekender’ also had a chance to view ‘Atypical Singapore’, an art and AR technology showcase which is part of the STB’s ‘Passion Made Possible’ latest wave of global campaign, at Kona in Jor Bagh. Tech Guru, Brandon Tay, had set up an interactive art installation using CGI called – Façade. It depicted a series of faces that changed basis the time of the day and the movement of people across the installation space. Atypical Singapore, a showcase commissioned by the STB put together a diverse array of interactive events and brought in a seamless blend of modern and traditional art by incorporating the use of augmented reality, moving images, illustrations and visual effects. This travelling showcase has been to Russia and Myanmar before arriving in India. Reviving the art of creating Zines, were the dynamic duo Knuckles and Notch who collaborated with Bombay Underground and Delhi-based Working Hours Collective. While interacting with the audience and giving them a glimpse of their work during their workshop, they went on to talk about the importance of bringing Zines back into the literary art scene as a unique storytelling medium. 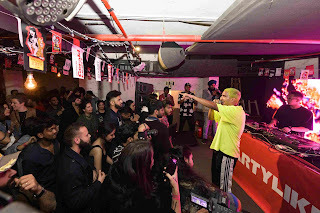 The Singapore Weekender also saw an exciting nightlife and entertainment evening, themed as ‘#PartyLikeInSg’, at Hauz Khas antiSocial. The evening featured an exclusive bar pop-up by popular Singaporean bar, Jigger & Pony where Jerrold Khoo, award-winning Singaporean mixologist, rustled up refreshing cocktails for the guests alongside Gresham Fernandes, Culinary Director of the Impresario group, who created mouth-watering Singapore-inspired tapas. Indian rapper Prabh Deep enthralled the crowd with his Punjabi-English hip-hop tracks. The party night was rounded off by the latest rapping sensation from Singapore, Yung Raja as he belted out his Tamil-English rap-hits on stage to a crowd of dancing party-goers. While the Singapore Weekender (15 – 17 February 2019) has concluded, the Lodhi Art Festival, including works by the Singaporean artists, continues with curated tours at Lodhi Art District and immersive walkthrough multimedia experience at Kona in Jor Bagh. Art enthusiasts can view and experience the artworks of the Singaporean artists at Lodhi Colony (Between blocks 13 and 16) and Kona, Jor Bagh before 10 March 2019.